Join Sam’s Club and Get a $20 Sam’s Club Gift Card! Join Sam’s Club through this EXCLUSIVE offer and get a $20 Sam’s Club Gift Card! That will definitely help you get some shopping done right away! This offer is only valid through April 30th, so don’t delay! 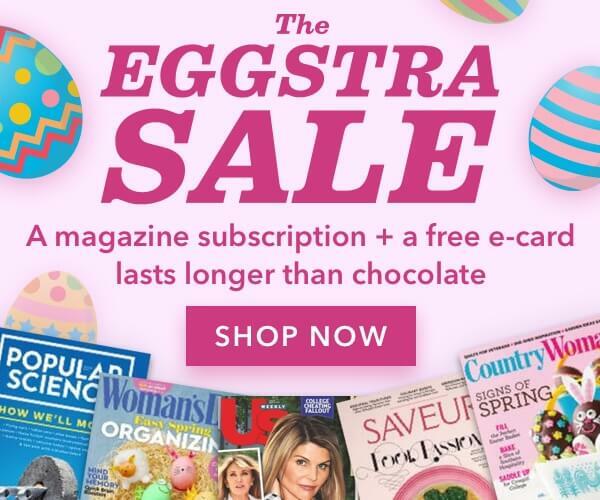 Shop the Discount Mags Easter Eggstra Sale! Discount Mags is having their Easter Sale! Through the end of the day on Monday, you can score Eggstra special deals for your loved ones this Easter! There’s a large selection of magazines included in this sale…something for everyone! And in most cases you can lock in multiple years for that super low price! And you’ll get a FREE e-card too! Getting ready to celebrate a graduation? Show off your graduate with this nice deal from Shutterfly! Score 10 Free Graduation Announcements when you use the promo code 10GRADCARDS at the checkout! Taxes, shipping and handling will apply. This offer is valid through June 30th. I wanted to note that I added this promo code to my account and it doesn’t specify “graduation”…just cards. So if you needed some other type of card, it’s possible this will work for that! Grab Pampers Cruisers for Your Baby On-the-Go! Because baby is on the go, their diapers need to move with them! Pampers Cruisers offer a 3 way fit for a freedom to move as they do and stay dry! Pick them up at Walmart, Target, or Amazon! Subscription to Esquire Magazine just $4.95! Through the end of the day on Saturday, you can grab a subscription to Esquire Magazine for only $4.95 per year from DiscountMags.com — just use the promo code FAMILYSAVINGS at the checkout!! It covers everything a man needs to know each month including the latest on style and clothes, what’s new in cars, culture and entertainment and advice on money matters. And you can lock in up to 4 years at that great price!! You can also gift a subscription or even renew your own at that price!